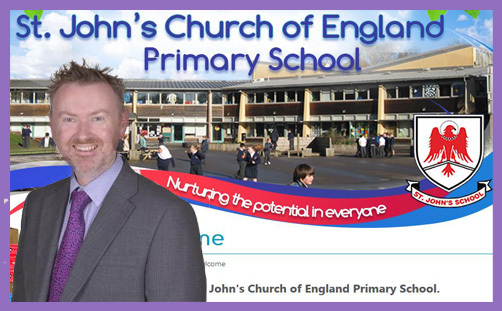 Dan Turvey B.Ed (Hons) NPQH is headteacher of St John’s Church of England Primary School in Royal Tunbridge Wells, Kent. “Christian values are at the heart of all we do and our Christian ethos is very strong,” he writes in his website welcome. Looking at their vibrant Gallery page, they appear to do lots of edifying Christian things, like ‘Easter Prayer Stations’, ‘Tudor Day’ (jolly good), carol concerts and Harvest Festival in St John’s Church, with which the school has strong links. So they do things like taking assemblies (the statutory ‘Daily Act of Collective Worship’) and helping out with RE lessons (because, frankly, it is a woefully neglected subject in the curriculum, very often palmed off to under-employed geography or PE teachers who just happen to be Christian/Muslim/Jedi-inclined). Crossteach is exactly the sort of professional and ethical charitable outfit with which a lot of schools would love to work, particularly with that (often) awkward Daily Act of Collective Mind-Numbing Banality Which Passes for Worship. But a group of parents at St John’s Church of England Primary School weren’t happy with Christians coming in and talking about sin and Jesus and judgment and men and women getting married – you know, some of that basic Christian stuff which Dan Turvey says is at the heart of all they do because their Christian ethos is very strong. These parents objected to such “extremist beliefs”, and say Crossteach had been “upsetting children with a fundamentalist approach”. Robustly defend the Crossteach commitment to Christian orthodoxy? Thank them for their 16 years of loyal and faithful service to his school, which is, after all, a church school? Bless them for enabling hundreds of young people to critically engage with the Christian faith in a fun and relevant way? Send the zealous complaining parents packing with fleas in their ears? And thereby he attests to the veracity of the parents’ complaint about ‘hate’ and ‘extremism’, pronouncing Crossteach unfit to lead school assemblies, and inadequate to assist with RE lessons. It’s a wonderful Christian witness for a church school – is it not? – when the party which is judged to have done no wrong has its good name tarnished by a supine headteacher who publicly condemns the group by banning them from leading assemblies and taking RE lessons (they are still permitted to lead optional after-school clubs “for those children and parents who wish to carry on”, which is very Christian of him). Crossteach often works in partnership with local churches and reflects their teaching, always aiming to be sensitive to the local context, and recognising that churches vary. Crossteach always works within the policies and guidelines of each school, and these sometimes vary from school to school. There is usually a member of the school teaching staff present at every Crossteach activity and in 16 years of working in schools no teacher has ever raised with Crossteach a concern that something that has been said could be interpreted as in any way ‘hateful’ or ‘extremist’. What a pity that Dan Turvey B.Ed NPQH fundamentally failed a rather important test of church school leadership, just “to bring an end this campaign and allow us to move on”. Unfortunately he has ensured that it will run, and run, and run.